Tell your marketer who your audience is as far as location, price and clientele. Ask any candidates to do a little test for you, and let them show you what they can do. Hold your social media person accountable with an end of the word day debriefing. 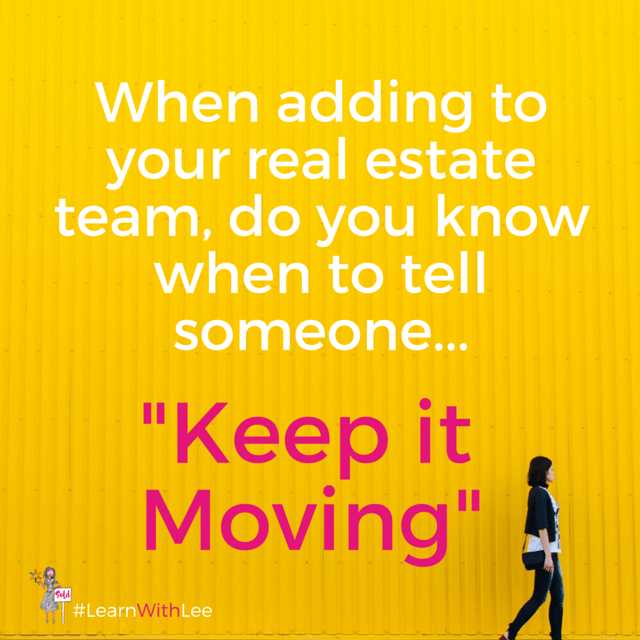 Learn with Lee, who says: Keep it moving. Do you have a difficult time consistently marketing your real estate business on social media? Whether you are busy managing the day-to-day details of your clients and closings or just feel that social media is not your thing, then it might be time for you to hire a social media marketer. I can hear your lips smacking because I know you might have tried that and paid good money for someone that did no better than you. That is frustrating. However, I wonder if you tried these steps before hiring the last guy, gal or group? If you did not, then give it another try but make sure you add these tips to your social media marketer selection process. I hope that was helpful for you. By the way, I personally love crowdsourcing sites (such as Fiverr and UpWork) to find social media marketers (using these steps, of course) because this is not a job position that needs to be local. You can have a wider pool of job candidates and save money with crowdsourcing if you vet new hires properly. Lee Davenport is a licensed real estate broker, business doctoral student, trainer and coach. Learn more about the training and 1-on-1 coaching programs that she offers by visiting www.AgentsAroundAtlanta.com. Follow her on Google+ and Facebook.